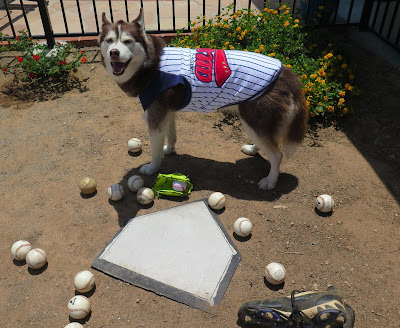 Dogs Luv Us and We Luv Them: Take Your Dog Out To The BALL GAME! 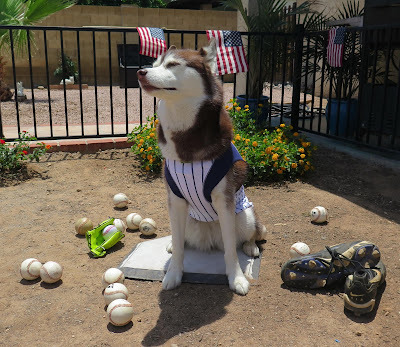 Take Your Dog Out To The BALL GAME! What's more American than baseball, hot dogs & apple pie? Taking your family to a baseball game in Summer is a great activity, but why exclude the family dog from the fun? With Bark In The Park events cropping up all over the country, you can bring your dog along! 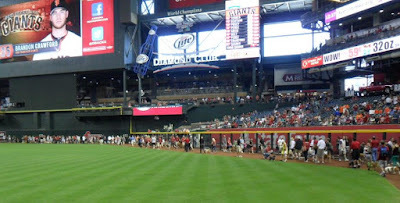 We loved taking Icy out to one of the dog friendly Diamondbacks games in Arizona. I am so ready for the game! Dad and I have been practicing. Many baseball stadiums have embraced dogs as an integral part of the family and have begun to accommodate them at the big game! You pre-register your well behaved, vaccinated dog prior to the game and buy her ticket along with your own. Your dog can sit with you in designated parts of the stands for the game, or outside in a grassy area where you can still view the game but from a distance. I will howl along as they play the National Anthem at the game! A stadium will usually choose a couple of games throughout the season that are dog friendly. They often make these events a fundraising activity for local animal shelters or other charities, so your dog can help you give back to your community! At the Diamondbacks baseball stadium they usually have a Puppy Parade or other fun event on the field prior to the game, and there is often a Vendor Fair where pet vendors showcase their products - and give away some samples! I sit nicely in the stands while Mommy & Daddy watch the game. Guess how many hot dogs I get to eat at the game?! Your dog should be used to crowds and loud noises before attending a ball game, otherwise it may be too stressful. If you have not successfully brought your dog along to other large, loud events such as pet expos or street fairs you may want to practice by taking him to a crowded, loud event first and see how he does. If you decide your dog will do fine at a baseball game, make sure he wears his rabies vaccination tag and have proof of any other vaccinations required by the stadium. Bring plenty of water and a chew stick or toy to relieve any anxiety he may feel being in a strange place. Be sure to find out all the requirements for dogs at the baseball stadium before heading out! 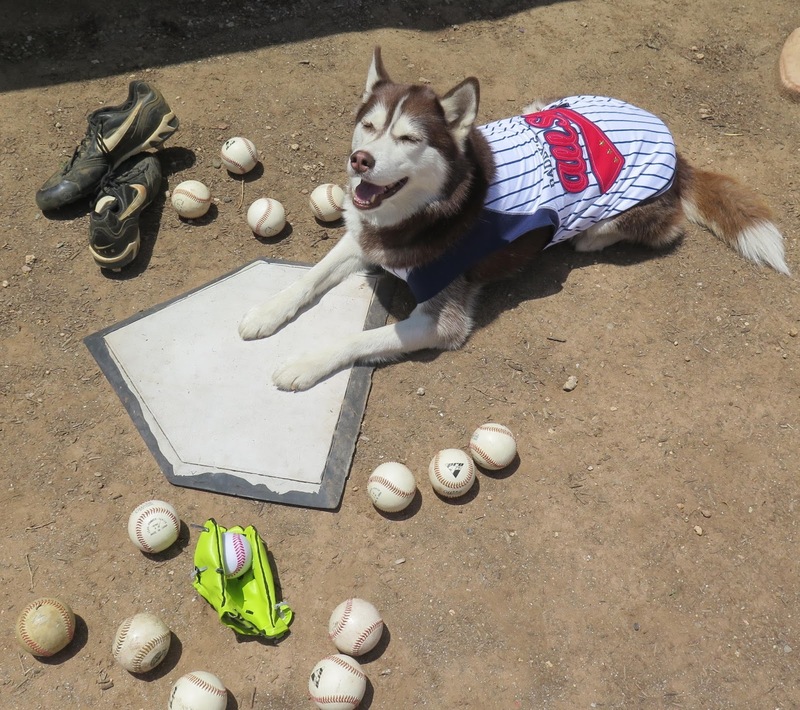 Taking your dog to a Bark in the Park baseball game is a Home Run! ﻿Have you ever taken your dog to a ball game? Do you plan to take your dog to a sporting event this Summer? Leave us a comment and share! We always love to hear from you! This is such a great idea and something we haven't done yet with Haley. I'm going to check into when the dog-friendly games are scheduled around here. Even if she doesn't enjoy baseball, she'll surely get a couple of bites from a hot dog, lol! Glad you like the idea, it so much fun! The hot dogs are a great side benefit for the dogs! Thanks for stopping by! I am so jealous! We no longer have a local baseball team and dogs are not welcome at our sporting events. That looks like such a great time! What a bummer! Arizona is so dog friendly, it's no surprise they have dog friendly games in their baseball season. Maybe schedule a road trip to a nearby city that has dog friendly games? Thanks for stopping by M.K. It's great that you have these events, hopefully you can make it one day soon. Thanks for stopping by the blog Sugar! Years ago we took our first dog to several "dog days of summer" events at our ball park. Only ball games I have attended as an adult! It was fun! Enjoy your game! That's so funny, the only ball games you've been to are the dog friendly ones - I love that, your dogs inadvertently introduced you to baseball! Thanks for stopping by! That is such a shame! You should rally a bunch of dog lovers together and lobby for them to bring it back! Thanks for stopping by Caren! Our local minor league team does Bark in the Park nights! We wanted to attend the most recent one but it rained the entire day. Great post! Oh, you got rained out - that stinks! I hope you can make the next one, especially since your beautiful Husky is so well behaved! Thanks for stopping by Faith! Sounds like fun! Great photos - love the baseball uniform! It's great fun, thanks Vicki! That sounds like so much fun! We don't have any local teams where we could go though....one of the downfalls to living in such a rural area! It really is a great activity to do w/ your dog as long as they can handle crowds. Maybe a road trip to a nearby city that has a dog friendly game is in order? Thanks for stopping by, Janet! Aw your such a good pup!!!! Sounds like loads of fun! It's a really good time, thanks for stopping by Jenna! Fun! The Padres play in Petco Park, so they always have a dog-day once per summer at the game. I would love to go some time. Unfortunately, Rita doesn't do well in crowds, so if we did go she'd have to stay home - and then I'd just feel guilty going and saying hi to all the other cute dogs without her! Oh that's great! Too bad Rita doesn't do well in crowds, but maybe one day she will be able to work up to being in larger crowds. Don't feel too guilty about leaving her home, I bet you'll pick up some fun treats or toys at the event to bring home to Rita! Thanks for stopping by! Sounds like so much fun! What great photos! Sounds like the perfect family outing, and love that you can take dogs too! I saw my first ever baseball game in Baltimore a few weeks ago, which was awesome. Oh wow, you've just been to your first game? How exciting! The dog friendly games are so fun, you should check it out. Thanks for stopping by! Dog friendly ball parks. How cool!! Thanks for telling everyone about that. We don't really have a ball park like that nearby, but one day I might have Mommy "take me out to the ballllll game"! BOL!! It's very cool, I'm happy to share with everyone. I hope Mommy will take you out to a ballllll game soon Pixel! Thanks for stopping by! yup! While we were in DC before BlogPaws, Riley and I took in an Orioles game, they were playing the Mariners, who just happen to be our favorite team!! How Will Your Pet React In An Emergency? BlogPaws2015: A Mecca For Pet Industry Bloggers!